All horses listed are current on shots (VEWT, West Nile & rabies) & have a current negative Coggins, ready to travel. Generous terms available. Satisfaction guaranteed. Stout, athletic dark bay gelding with star, snip & front socks. Very gentle & easy to handle. Loves to be petted. Loves kids. Over 14.3 hh & very solid. 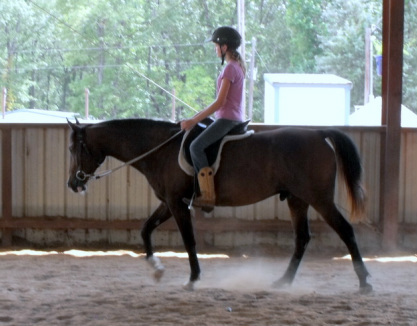 Suited for dressage, show hack, sport horse, hunter under saddle, or Western riding. Broad chest, straight legs, big hip, kind eyes, & very long, shapely neck. 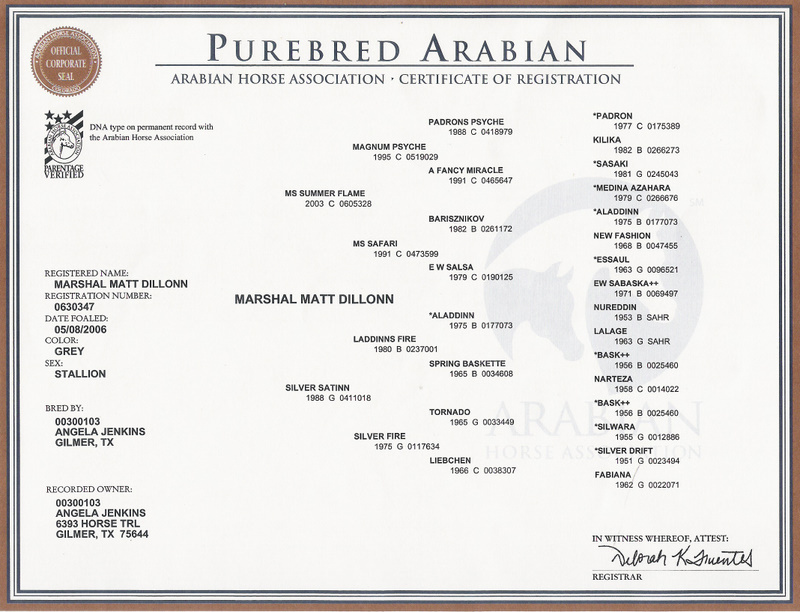 Unique pedigree includes *Farazdac, Gazon, *Witez II, *Padron, *Ansata Ibn Halima, *Serafix, TSatyr, & Fadjur. 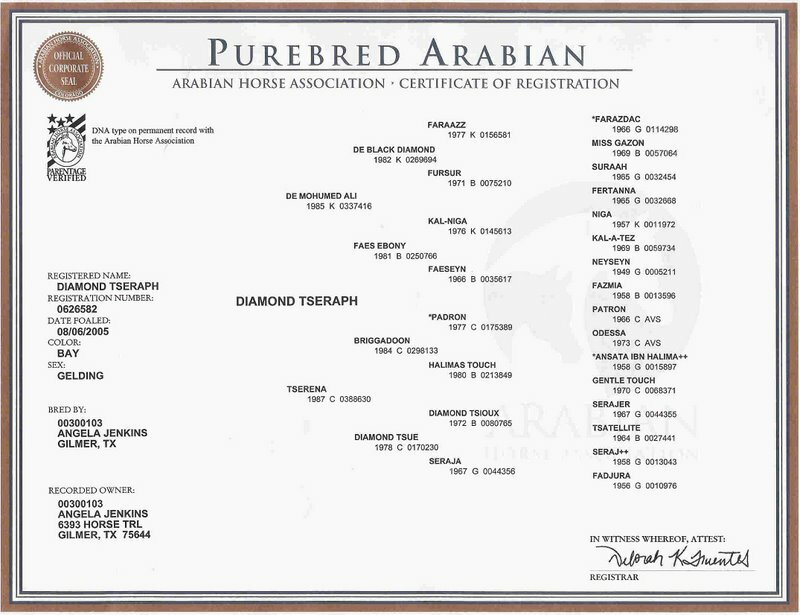 His sire was a Regional Champion dressage horse in open USDF competition, against all breeds, on the tough Florida circuit. His dam was a working ranch horse and a show horse in Country English, as well as a versatile family pleasure horse. This gelding has almost a full year of professional training, has been ridden in several dressage clinics, was well started on jumping, & has completed an ACTHA trail ride. He has a long, smooth stride with good cadence, & is very steady in his gaits. Easy, fun horse to ride, with potential to progress up the levels in dressage, given a serious partner to train with ... or he could happily carry junior riders to fun shows, parades, & trail rides. 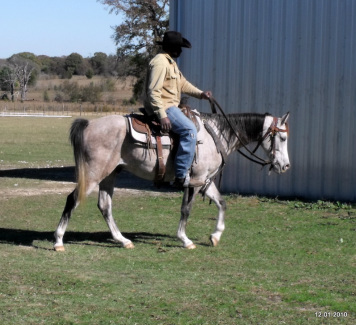 This is an old-time, athletic, versatile Arabian gelding, just waiting for someone to love him & be his partner for life. Dappled rose grey with black mane & tail, blaze & 4 socks; beautiful big dark eyes; & that extra-long, shapely neck that you expect from a Magnum Psyche grandson. Smart, quick, & extremely athletic, with a great personality, Dillonn has potential for Western pleasure, any working Western event, hunter, dressage, sport horse ... or could be a competitive endurance horse, as he has great stamina. Ready to be a versatile pleasure and trail riding companion. Could easily be your next Champion, in most any event you choose. Likes free jumping, has never taken a wrong lead, & would make a great youth or amateur prospect for dressage, reining or almost anything except saddleseat English. Anyone who can ride can ride Dillonn. He loves attention, loves praise, is fearless on the trail & will try anything you ask him to do. Just needs more riding to be the perfect pleasure & show horse. Stands about 14.2hh & is all heart; doesn't know how to quit; never seems to get tired. Had 5 months of professional training, including some work with cattle, sorting & penning, & some work over obstacles. Beautiful mover, very free in the shoulder & light on his feet.